Right now the movement to travel more sustainably is gaining rapid momentum. In a recent 2014 travel survey, a whopping 44% of respondents declared that hotels do not give enough information on their sustainability practices. This has inspired sites like TripAdvisor to recently launch subsidiary sites such as TripAdvisor Green Leaders, a new platform to help travelers choose hotels and structures that are environmentally friendly.The initiative has already reached around 6,000 eco-friendly hotels and B&Bs around the world, and is gaining significant momentum. So what does traveling sustainably mean? Responsible travel is not just about recycling garbage and turning the light switch off when you leave your room, it is also about supporting hotels, lodges, and resorts that enhance sense of place and help protect the character and authenticity of a destination. Such destinations look to protect local plant and animal life, support the local culture, and positively impact the ecosystem that they are a part of. Although Summer is already in full force, it's not too late to seek out some of these destinations. Whether you are dreaming of a beach paradise, a hot tub on the ledge of Wyoming's beautiful ski slopes, or a more unique getaway to the Mexican jungle, thankfully there are now more sustainable options to choose from that help you leave a lighter footprint in the communities you travel to. Summer is in full force, but it's not too late to get away for a little R&R. Whether you are dreaming of an beach paradise, a hot tub on the ledge of Wyoming's beautiful ski slopes, or a more unique getaway to the Mexican jungle, thankfully there are an incredible array of eco-friendly retreats popping up throughout the world, allowing for excellent and diverse ways to travel in sustainable style. We did our research and compiled our Top 7 recommendations for an eco-friendly vacation. The Bardessono boutique hotel is within driving distance of San Francisco and California's sprawling wine country. It exemplifies how design and sustainability don't have to be at odds with each other, earning a LEED Platinum distinction (like 3 Michelin stars for sustainable construction) while achieving a simply stunning aesthetic. Saving the planet never looked so luxurious. Gateway to hands down my favorite place in the world—Yellowstone National Park—Jackson Hole is an excellent destination for outdoor adventures and the most stunning natural scenery in the North America. I lived in Jackson Hole for a summer, and woke up to buffalo outside my door, as well as the most stunning views of the Teton Mountains to a cup of hot coffee. There's no better place to stay than Hotel Terra, the area's number one eco-friendly hotel. If you're looking to hike, fish, ski or just get more in touch with nature, this is your spot. The Mandarin Oriental Hotel was built to block heat and maximize natural light. They use CFL bulbs and toxin-free furnishings. Even the sushi bar serves sustainable fish. Yes, even in Sin City, it's possible to be good for the environment. No guarantees for your bank account or personal reputation, however. The piping plover is an adorable, but endangered little bird. Rhode Island established the Goosewing Beach Preserve in part to protect this globally rare species, in part to maintain the area’s pristine beaches, dunes and coastal ponds. Residents consider it the state’s most scenic spot for it’s unspoiled, beautiful stretches of nature. Not hard to see why. This beautiful bay is actually a flooded volcanic crater, now teeming with colorful fish and coral reef. 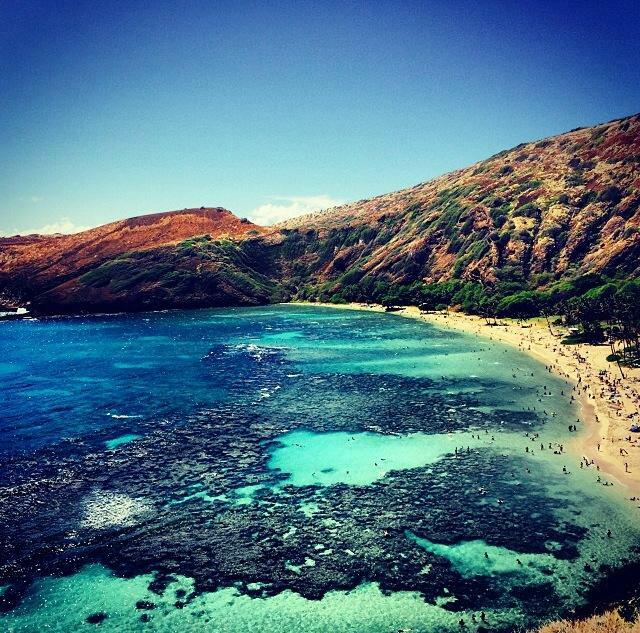 It's one of Hawaii's most popular tourist destinations, and it unfortunately suffered the consequences of overuse before the Hanauma Bay Nature Preserve was officially founded. Before then, the bay received as many as 3 million visitors per year, and we even used dynamite to blow away some reef in order to string telephone cables to Hawaii from the U.S. west coast. Now visitors must refrain from touching animals or coral reef and littering offenses are strictly enforced. The change in attitude has helped restore the area to pristine conditions. Perfect for snorkeling! Named the No. 1 hotel in Central America by Conde Nast, the Finca Rosa Blanca is one part luxurious inn and one part coffee plantation. It's also the only hotel to ever win a perfect 100% score from the Sustainable Tourism Certification program through it's ambitious and dedicated approach. The hotel uses solar panels to heat its water, buried it's entire electrical system to avoid interfering with wildlife, and grows its own organic vegetables and herbs on-site for the restaurant. Love coffee and the environment? Finca Rosa Blanca is for you. Seems like everyone's talking about Tulum, a secluded spot south of the much noisier and touristy Cancun - and for good reason. Tulum is home to gorgeous beaches, enchanting jungles, Mayan ruins and incredible wildlife reserves, such as Akumal where you can swim with giant sea turtles. Sustainability is core to the community given it's very real concerns over shoreline erosion, so there are many eco-friendly hotels and restaurants throughout Tulum. We recommend Amansala, which dubs itself ‘Robison Crusoe meets eco-chic'. Make sure to take in a yoga session on the beach while you're there.